FOOTBALL: Seven-time champion Egypt will play in Sunday's Africa Cup of Nations final after a penalty shootout success over Burkina Faso in the semi-fnals. 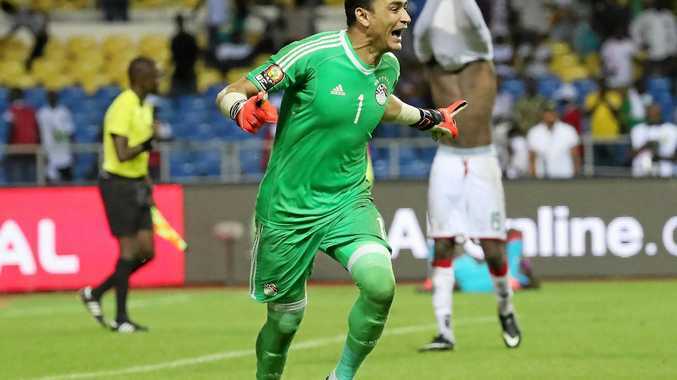 Veteran goalkeeper Essam El Hadary was the hero for the Pharoahs, saving penalties from opposing keeper Herve Koffi and then denying Traore from the last kick as the Egyptians ran out 4-3 winners in the shootout after the game ended at 1-1 after 90 minutes and extra-time. Roma star Mohamed Salah's scored a superb 66th-minute opener for Egypt but that was quickly cancelled out by Aristide Bance for Burkina Faso. That goal was the first conceded by El Hadary, 44, - the oldest ever player at the Cup of Nations - in 653 minutes at the tournament going back to 2010. This is Egypt's first appearance at the tournament after a seven-year absence. Egypt will play either Ghana or Cameroon in Sunday's final in Libreville, Gabon. It will look to reclaim a trophy it had won three times in a row between 2006 and 2010 before its fall from grace.